At TomDispatch.com, Tom Engelhardt has an especially fine exposé of the National Security State as a religion with its own priesthood, holy books, dogma, and true believers/followers. I recommend reading the entire article, but I do want to highlight some implications of his argument. Like the Catholic Church (and I’m Catholic), the National Security State is hierarchical, conservative, and often anti-democratic. We, the laity, have little if any say in how the system operates, even as we’re the ones who fill the coffers and collection plates. We are subject to a militarized (or militant) aristocracy that sees itself as uniquely privileged, the “best and the brightest,” working to keep us safe from the devil of the day. To question the system and privileges of the powerful is to risk being seen as an apostate. But the Catholic Church is, at least in theory, dedicated to the cause of peace (though historically sometimes at the point of a sword). The U.S. National Security State, despite (or rather because of) the evangelicals or true-believers in its midst, is dominated by a church militant and a church triumphant. This is unsurprising. Powerful militaries seek military solutions. Defeats or stalemates like Iraq and Afghanistan are reinterpreted as triumphs (at least for the U.S. military). If they defy reinterpretation, defeats can always be attributed to Judas-like figures within the body of the American politic, like the anti-war hippies of the Vietnam era (even if the latter looked more like Jesus than Lucifer). The biggest problem is how the dominance of the National Security State weakens our democratic structures, including our right to privacy. Consider the penetration and interception of all forms of electronic communication by the NSA and similar “intelligence” agencies. Like the Catholic Church with its rite of confession, the NSA listens to our “sins” in the name of safeguarding us from harm. In the bad old days, the Church used its rite of confession to gain access to the secrets of the powerful. 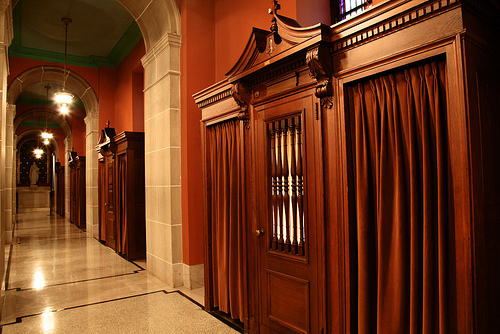 Leave it to the NSA to trump the Church by turning the whole world into a confessional booth. Such a subversion of privacy doesn’t preserve democracy – it destroys it. Like the Catholic Church of the late 15th and early 16th centuries, the National Security State is choking on its own power and privileges, losing its sense of mission as it wallows in money and sanctimony. Where is Martin Luther when you need him? For like the Catholic Church in the 16th century, the U.S. National Security State needs a serious reformation. Update (1/7): At TomDispatch.com, Nick Turse has a great article today on the growing reach and power of Special Operations Command (SOCOM) within the U.S. military. It’s a powerful coda to Engelhardt’s article. Extending the Catholic Church analogy, SOCOM in the U.S. military today is much like the Jesuit Order of the Catholic Church — missionaries of the American military across the world. And like the Jesuits they see themselves as an elite, as true believers, as holy warriors deserving of secrecy and privilege and power. As such, they believe they should not be accountable to the laity — meaning us. Neither do they believe they are accountable to our legal representatives in Congress. They answer to their Loyola (Admiral McRaven) and ultimately to the Pope (whoever the commander in chief happens to be, as long as he supports them). The National Security State has truly become the new national religion of America. We worship at its Pentagon of Power, its huge NSA facilities. They are America’s true national cathedrals. Posted on January 6, 2014 by wjastorePosted in Society, US Military, US PoliticsTagged Catholic Church, confession, confessional, National Security State, NSA, Pentagon, tomdispatch. Tom Engelhardt.